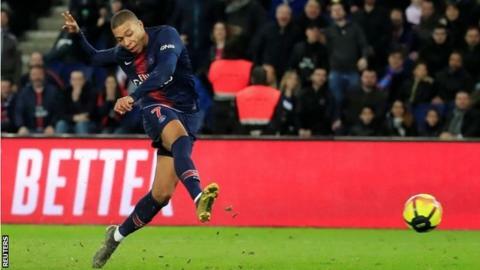 Kylian Mbappe passed 50 Ligue 1 goals with a double as Paris St-Germain beat Nimes to extend their lead at the top of the table to 17 points. Christopher Nkunku scored from Marco Verratti's pass over the top to put the champions ahead. Mbappe's landmark strike came when he prodded home Juan Bernat's cross to make it 2-0. And the 20-year-old added a second after chasing on to Nkunku's pass as PSG countered from a corner. The World Cup winner is the French top flight's top scorer with 22 goals in 20 games, and he has scored 27 in 31 matches in all competitions. Corner, Nîmes. Conceded by Leandro Paredes.